American Aldes has developed clean air solutions that positively pressurize homes with filtered fresh air to help prevent the infiltration of unwanted contaminants. Wildfires can spread ash and soot for hundreds of miles. Homeowners often complain of dust and ash build-up inside their homes, even though they are far removed from the danger of flames. Most people do not understand the cause or how this may affect their health, and even fewer understand that a solution exists to minimize this phenomenon. Ash, soot, and dust enter homes and apartments through leaks and infiltration points such as windows, doors, and common crevices around wall penetrations. Wind and negative pressure, which is caused by exhaust fans or leaky air conditioning duct systems, are generally the cause for “pulling” these contaminants into the home. Similar to other hazardous contaminants, ash and corresponding dust can cause health problems for millions of people. More than ever, homeowners are in need of solutions that filter the air brought into their homes so their families are not exposed to the dangerous particulates caused by wildfires. The EPA reports that there are approximately 2 million emergency room visits per year in the United States due to asthma attacks, and 19% of families have at least one asthmatic person. The toxic smoke and ash resulting from wildfires can severely aggravate asthmatic symptoms and can be problematic and even dangerous for all people in higher concentrations. American Aldes recommends keeping homes sealed as tightly as possible and using mechanical ventilation to provide the clean, fresh air that is necessary for good health. Sealing a home tightly without providing a source of filtered, fresh air from outside is dangerous and can trap all kinds of pollutants inside a home. The EPA estimates that the air inside a home is 2 to 5 times as polluted as the air outside a home. A Filtering Supply Ventilator (FSVS) filters outside air to remove contaminants and particulates before introducing a continuous, low-volume of fresh air into a home. This fresh air would then be cleaned for distribution throughout the home, either by an existing air conditioning and/or heating system’s ducts, or directly with its own duct system. A Blending Ventilator (BVS) is a type of supply ventilator that also blends conditioned air from inside a home with precise amounts of fresh air from outside the home before distributing the tempered-filtered air to habitable living spaces. 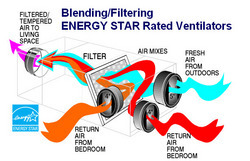 A Blending Ventilator provides the additional benefit of filtering both indoor and outdoor air. Important Note: If fires are in very close proximity, fresh air supply ventilation systems should be turned off to avoid inducing sparks or embers into a home. Both of these filtered supply air strategies can create positive air pressurization of the home, preventing unwanted contaminants such as smoke, ash and other volatile organic compounds from entering the home through uncontrolled leakage points. As an example, thousands of homes and apartments surrounding airports use American Aldes BVS and FSVS Ventilators to provide filtered fresh air under the federally funded FAA Noise Mitigation Program. These types of programs are intended to minimize noise, airplane exhaust soot, and pollution from entering homes surrounding airports. BVS and FSVS fans are available as kits or standalone fans. 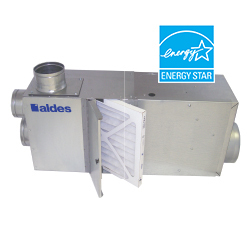 See Residential System Solutions and Fans for more details.